One of the biggest challenges for new managers is how to get the best out of each of their team members so they achieve superior results-and make you, the new manager, look good! 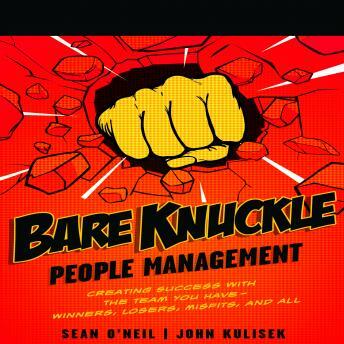 In Bare Knuckle People Management authors Sean O'Neil and John Kulisek cut through the crap to show managers how to push their teams to success, not by following fluffy leadership training but by using the skills that got them promoted in the first place. Forget kumbayas or one-minute managing. The best people managers know that approaches that work great with one employee will be lost on the next. With the same irreverent and straightforward style they use in their management training workshops, O'Neil and Kulisek describe the 16 basic worker types you must learn to recognize, from The Badass to The Burnout, and how to customize your leadership style for each type. The authors encourage the listeners to take pieces of what works from each of the sections and they also remind them to follow the gut instinct that got them to their new management position in the first place. Written in short, easily digestible sections, and both entertaining and insightful throughout, Bare Knuckle People Management is perfect for any manager pressed for time and in need of some straightforward advice.